A trend that’s starting to gather a following across the world in recent years, winter sowing is one of the most carefree and simple methods for starting your spring garden seeds outdoors. That’s right, you start them outside. The premise is so basic that it makes so much sense you have to wonder why more people aren’t doing it (including you). 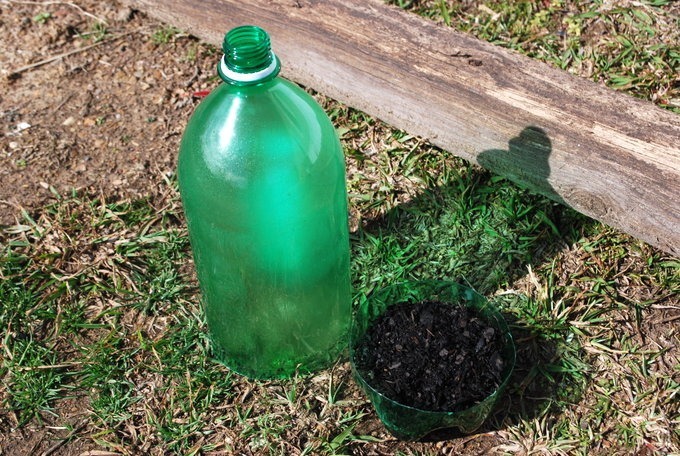 In short, winter sowing involves reusing containers like milk jugs, clear takeout containers and soda bottles as outdoor terrariums. In the illustration at the top of this post you can see the 2-liter soda bottle that is currently incubating a few of my precious Aunt Ruby’s German Green tomato seedlings. Rinse the container well with warm, sudsy water. Carefully cut around the base of the container making a seed starting tray that’s about 3” high. Poke a few holes in the underside for drainage. Fill the base with well-moistened seed starting medium or clean soil and plant a few seeds per instructions. Discard the lid and affix the top of the container to the base with tape. Place the container outdoors where it can receive regular sun without sitting in water. Check the containers every few days or so to ensure that the soil is moist. When the weather warms up enough for the seeds to germinate and get their start, winter sowing helps speed up and simplify the process because it eliminates the usual step of hardening off your indoor sown seedlings.